NB: These tools are for all DSLRs – regardless of make or model. What camera settings should I use for shooting children, new-born babies, beach sports, street candid’s, making water look smooth? etc. What’s the correct exposure given my current lighting & subject? What alternative exposure settings would be correct for my current lighting & subject? What’s my depth of field, given my DSLR, my focal length, aperture etc? What’s the hyperfocal distance for this landscape shot? What’s the closest/furthest that things will be in focus for my current settings? What’s my maximum flash range given my current settings? 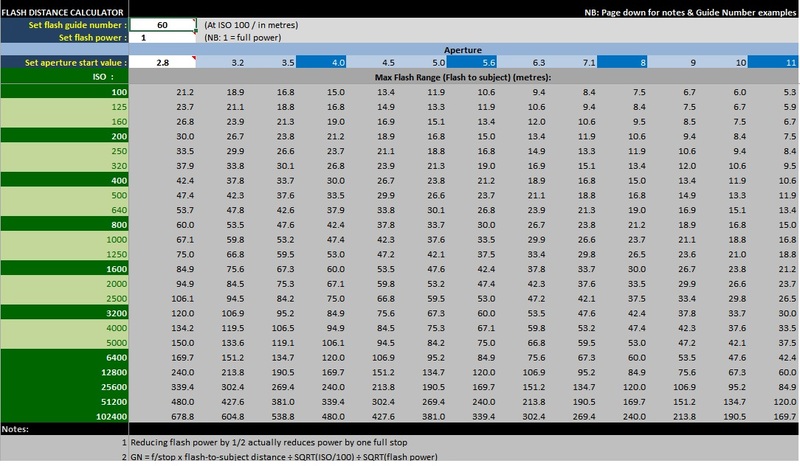 My subject to flash distance is 8m, what ISO/aperture combinations can I use with my flash? These, and an abundance of other questions can be answered by my PhotoTools calculators and Camera SCENE settings. It’s supplied as an Excel workbook. It’s completely locked down to avoid accidental deletions & changes, so looks, feels and operates similar to an “app” on your phone – except it needs keyboard & mouse inputs of course. PhotoTools contains macros and is saved as a .xlsm file. Excel (or other spreadsheet tool) will mention this when opening the file. Just accept the warning to open the file and run the macros in it. If you have an older version of Microsoft Office, then please download and install the Microsoft Office Compatibility Pack for Word, Excel and Powerpoint. This will enable you to open the .xlsm file; which is an Excel 2013 file. Travel Portraits, Outdoor Portraits, Candlelit Portraits, Children, Kids Playing, Sharp Family Shots, Music Bands/Gigs, City Candid Portraits, Beach Portraits/Children, Newborn/Babies, Effective Group Shots, Off Camera Flash Portraits, Windows Lit Portraits, Portrait Details (face sections), Documentary Shots, Stunning Monochrome Nudes, & Motion Blur. Beach Sports/Action, Team Sports, Panning Action, Winter Sports, Freezing Fast Action, & Freeze Action Subjects/Blur Backgrounds. Stark Winter Landscapes, Sunsets, Motion Blurred Artistic Sunsets, Stormy Sky Land/Sea Scapes, Snow Landscapes, Spring Landscapes, Sharp Landscapes, Minimalist Seascapes, Sunrise & Sunset, Seascapes, Stunning Reflections, Stormy Skies, Misty Telephoto Scenics, Autumn Woodland, Autumn Tree Canopies (looking up), Slow Water (“milky” water effects) & Striking Black & White Landscapes (infra-red). Fast Birds in Flight, Pets, Insects & Bugs, Birds, Winter Flocks of Birds, Animals at the Zoo, Exuberant Spring Lambs, Birds of Prey Portraits, Deer in Parks, Birds at Feeding Stations, Butterflies & Wetland Birds. Star Trails, Vehicle Light Trails at Night, Night Boats in a Harbour, Fireworks, City at Night, City at Twilight, Sparklers, The Aurora-Borealis (Northern Lights), & The Moon. Light Up The Scene With Torchlight Exposures, Morning Frost, Christmas Lights, Sharp Water Droplets & Ripples, Window Glass Raindrops with Cityscape/Landscape Behind, Indoor Still Life (fruit bowls etc), Steam Trains, Aquariums, Handheld Building Interiors, Abstract Urban Details, Blurred Woodland Shots, Coloured Flame Effects Over Silhouetted Person, & Mock Moonlight Landscape Shots. 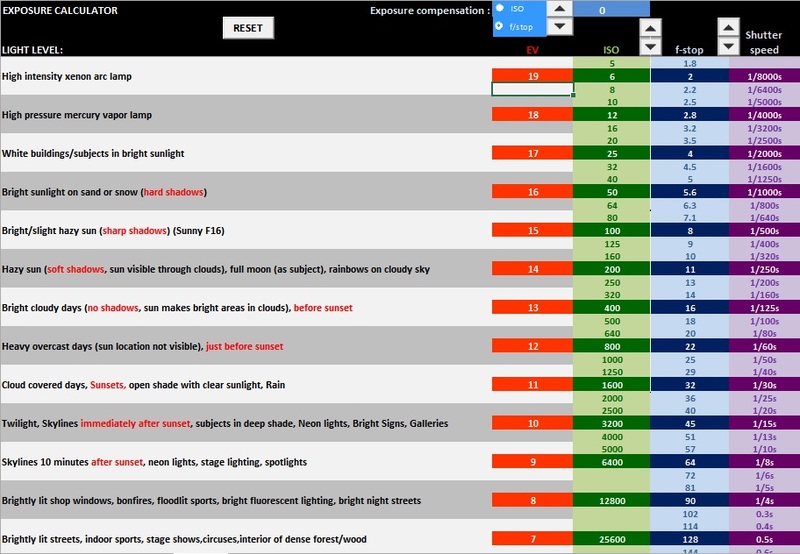 Exposure mode, Focus mode, Shutter speed, Aperture, ISO, Lens, Drive mode, White Balance, When best? & Support. I’ve also included some tips and pro-tips. 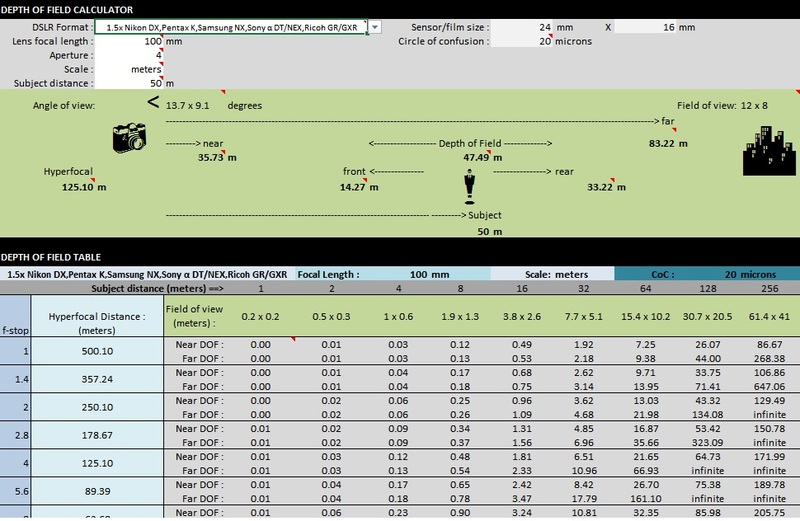 They are supplied as an Excel workbook and a printable PDF. 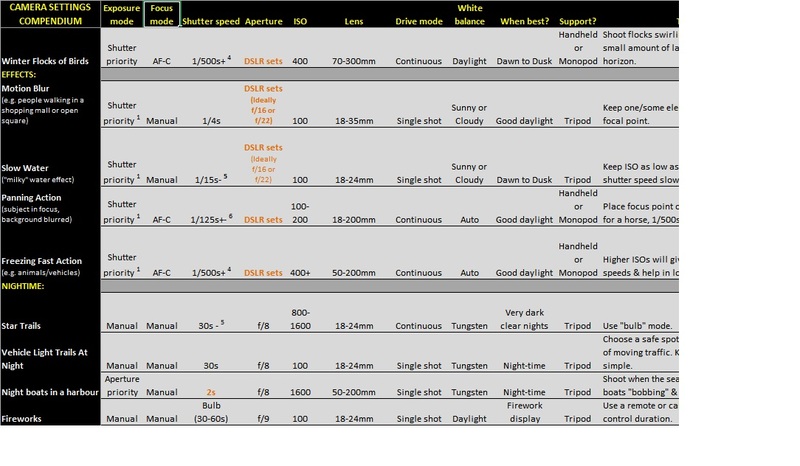 If you’d like a quick reference Scene Settings Guide that you can print and put in your pocket or camera bag for when your out in the field, then this is the guide for you. The screenshot below shows just a small section of the settings list. Click on the image for a larger view, then click back in your browser. Guarantee…………………… If you’re not happy with the download I offer a no-quibble refund. Payment is via PayPal or credit/debit card (Master Card or VISA). Select one of the options below and click Purchase then Checkout. After payment you will be directed to the download page and also receive an email with your purchase/download details. If you buy PhotoTools with the Configuration Workbook/BIN files and/or Movies Package – you’ll save some money! See here for details.